Posted February 26, 2015 by Alannah Maher & filed under Arts & Entertainment, Theatre & Performance. Prepare to be transported into a world of astounding colour and passion, as The China Arts and Entertainment Group bring the award winning dance drama The Red Dress to Sydney’s State Theatre. This drama is a touching story of persevering love told through the unique style of the Chinese folk dance language. 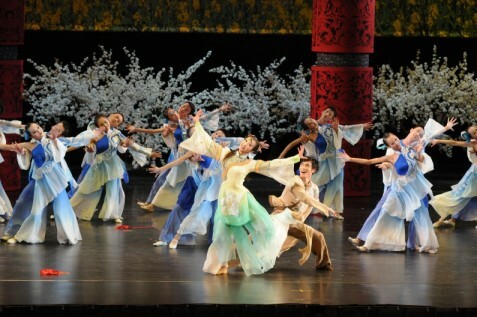 The performance provides a dazzling glimpse into wedding customs of southern China through a young man and woman from wealthy families in an ancient town. Sweethearts from a young age, they fall in love and promise to marry one day but are separated when he must leave to make his fortune in the city. With a cast of nearly fifty dancers, they recreate the age-old tale of love, loss and tradition as the beautiful bride-to-be waits to be reunited with her betrothed and marry in her red wedding dress. The China Ningbo Performance and Arts Group debuted The Red Dress at The Ningbo Grand Theatre, and have since taken the show around the world to multiple curtain calls and sold-out box offices in Hong Kong, New York and Shanghai.